Ever since his blistering knock in the final of the Nidahas Trophy against Bangladesh in Colombo where he gave the Tigers nightmares in the last few overs, Dinesh Karthik has turned out to be an integral member of the Indian national team as he has finished off quite a few games for his team. He also played such knocks for Kolkata Knight Riders (KKR) in the Indian Premier League (IPL). However, during the third and final T20I against New Zealand at the Seddon Park in Hamilton, the experienced campaigner couldn’t take his team over the line. He came to bat after Hardik Pandya was nipped out by Scott Kuggelejin in the 15th over. The 33-year-old didn’t look flustered by any stretch of the imagination and played his strokes freely to end on 33 runs from 16 deliveries. His knock was laced with four hits into the stands. Nevertheless, he was a part of a mini-controversy in the last over when the Men in Blue were chasing 213 runs. 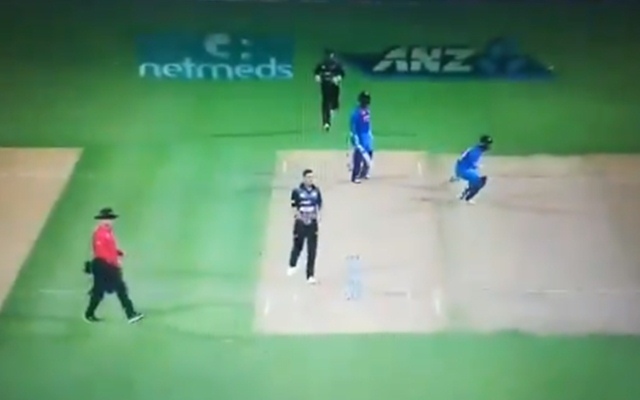 The incident took place in the third ball of that over by pacer Tim Southee. With 16 runs required off that over, Karthik could only garner a couple of runs off the first two balls. Then, he took the onus upon himself to see his team through. In the third delivery, the Tamil Nadu wicketkeeper whacked one down the ground. To everyone’s surprise, he didn’t take a run. Krunal Pandya also reached the striker’s end when Karthik sent him back. Surprisingly, even the left-handed Krunal was timing the ball to perfection and he remained not out on 26 runs from 13 balls with two fours and as many sixes. In the fourth ball, Karthik had no other option and he took the single, smacking his bat on to his pads in frustration. India needed 11 off the last ball, and Karthik deposited one over the ropes. Unfortunately, that wasn’t enough for the visiting team to avoid the series defeat.